ALBUQUERQUE, N.M. – The New Mexico Activities Association would like to advise the public of important information pertaining to the 2018 NMAA State Basketball Championships. The first round of the tournament will be played on Friday, March 2 (Girls) and Saturday, March 3 (Boys) at the home sites of the higher seeded teams. Tickets for the first round games will be $5.00. The Class A-6A seeding meetings were held on Sunday, February 25; brackets are now posted on the NMAA website at www.nmact.org. The Quarterfinals, Semifinals, and Finals will be payed March 6-10 in the Albuquerque metro area. UNM’s DreamStyle Arena will play host to the majority of the tournament, with all state championship finals being played on Friday, March 9 and Saturday, March 10. Rio Rancho’s Santa Ana Star Center and Bernalillo High School will host games Tuesday, March 6 – Thursday, March 8 (see NMAA website for specific bracket information). Rio Rancho High School and Cleveland High School will also be utilized on Wednesday, March 7 for the 2A Boys Quarterfinals. The University of New Mexico will charge $5.00 for parking for all vehicles for games played at DreamStyle Arena. Parking is free at the Santa Ana Star Center, Bernalillo High School, Rio Rancho High School, and Cleveland High School. Due to security protocols at DreamStyle Arena and the Santa Ana Star Center, it is recommended that spectators arrive early as metal detectors and bag screenings are now required processes for entry to the facility. * Pre-sale tickets for games at The Pit can be purchased by calling 505.925.LOBO or by logging onto www.unmtickets.com. * Tournament passes will be sold at the NMAA or by calling 505.923.3110 for $135 until Monday, March 5 at 3:00 PM. Tournament passes provide re-entry privileges throughout the tournament, as well as a reserved seat at UNM’s DreamStyle Arena. 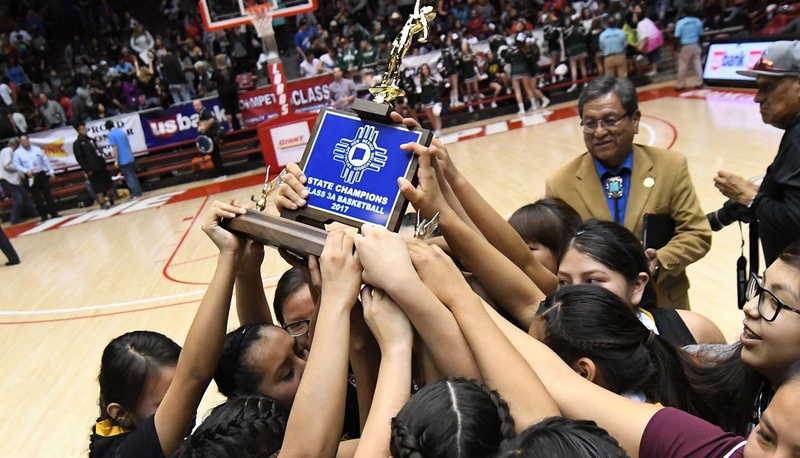 Graphic Connection is the exclusive State Championship Merchandise provider of the NMAA. Souvenir items commemorating this exciting event can be purchased at any of the five tournament venues or by calling (505) 821-2777 or visiting www.gcsportswear.com.